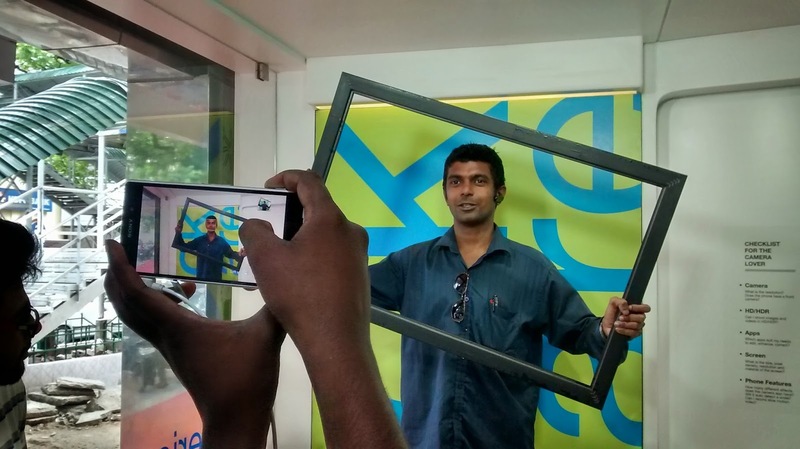 When I got invite for visiting Univercell Sync Store in Chennai to experience how Univercell can help enhance one's smartphone buying experience, I was also eager to find out how UniverCell is gearing itself up to take on the challenge from online retailers. The process of buying a phone has changed dramatically over the decade. A decade ago, camera phone, colour screen, polyphonic ring tone made a phone desirable. Factors like how many contacts/SMS the phone can store, torch, type of games it came with etc were the factors that helped purchase decisions. Even the once super desirable 25k+ phones- like N73 had to be purchased just by reading the specs and without getting to touch and feel a live unit. Things are different today. You first need to decide if you want Windows, Android or iOS. Only after that the brand and other specs are considered. Because everything is an App and is downloadable, its the hardware configuration and after-sales service that influences purchases heavily, along with price. Online retailers are able to sell phones 10-20% cheaper than brick and mortar stores, leveraging cost savings in logistics and economy of scale. Customers are more informed than ever and positive online feedbacks convince many to make purchase decisions even without seeing or feeling a phone. But that does't mean physical stores are extinct. They are fighting back with innovations and offering something online retailers can't provide- personalized hands on experience with the phones and its accessories, to be able to make more informed purchased decisions and a host of after sale services not yet available online. With that background, let us explore what Univercell Sync has in store for us. 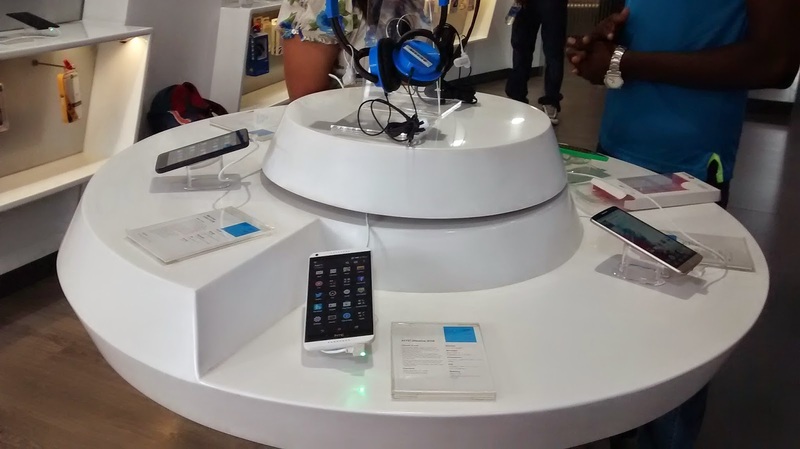 Univercell Sync is an experience store where a visitor can gets hands on live experience on all latest models, take pictures with the phone, get it printed, try suitable accessories for the phone, get advise on apps to use and avail a host of after sales service. As customers walk in, first desk on the left has all the latest models. This is because everyone is usually interested in checking out the latest ones first. Next to that is a photobooth- a small platform with a green background and a few dummy frames to pose with. 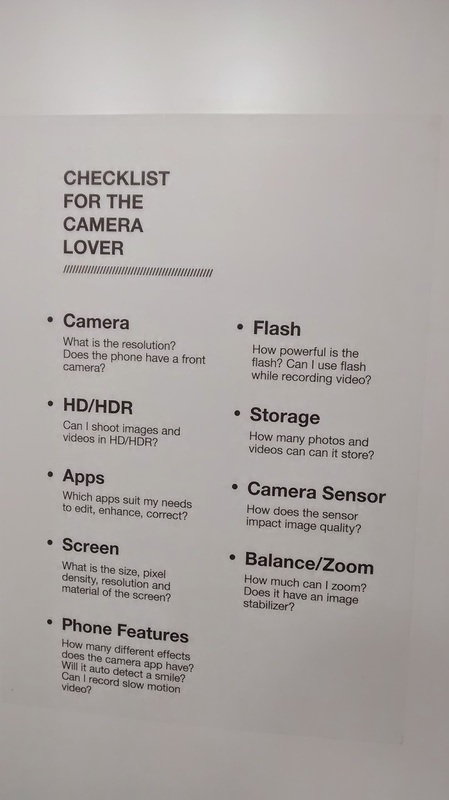 Since almost everyone wants to use the camera feature in their phone, this section lets them experience the camera capabilities of the phone they have in mind. A set of tips advises customers what to look for in a camera. After having tried clicking pictures, should you wish to print them, there's a small LG portable printer, which costs Rs 10000 approx. This device talks to all phones using NFC/WiFi and can give a smaller than postcard size. I am not sure to what extent this printer is really useful, but the idea is that should you wish to print, you can buy suitable printers. Next is the music booth, where a host of music accessories, starting from an earphone worth few hundred to super speciality speakers/headphones worth Rs 12000 are displayed. Prospective buyers can try out how music plays in each of these accessories, try out docking stations etc. 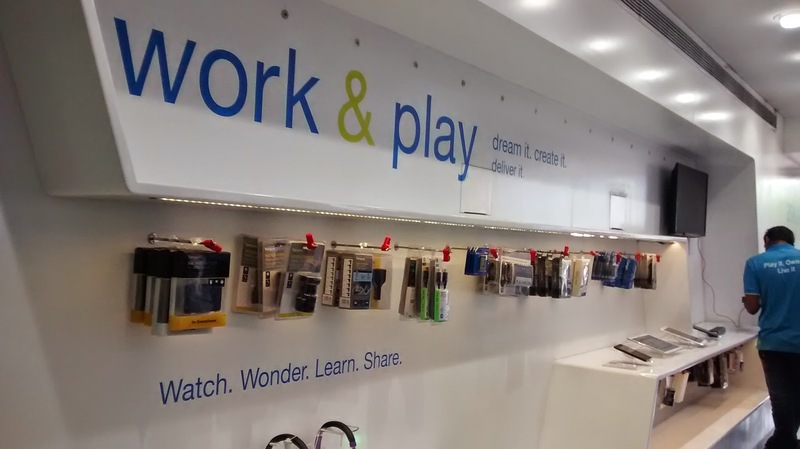 You should note that most of the stores that sell music accessories (and in the online world) often need you to buy the gadget before it can be opened and experienced. Soumya Menon, VP Brand Strategy explained that customers often come with a budget in mind (say I need a phone in 20k range) but hardly plan for accessories. Not having the right accessories can spoil the fun. Hence Univercell Sync staff can understand a prospect's usage/needs etc and then recommend right kind of accessories for the phone. With this information, customer may eventually opt to spend little less on the phone- say 15k and spend rest of his/her budget on the right kind of accessories- earphones, power banks, memory cards, printers etc. 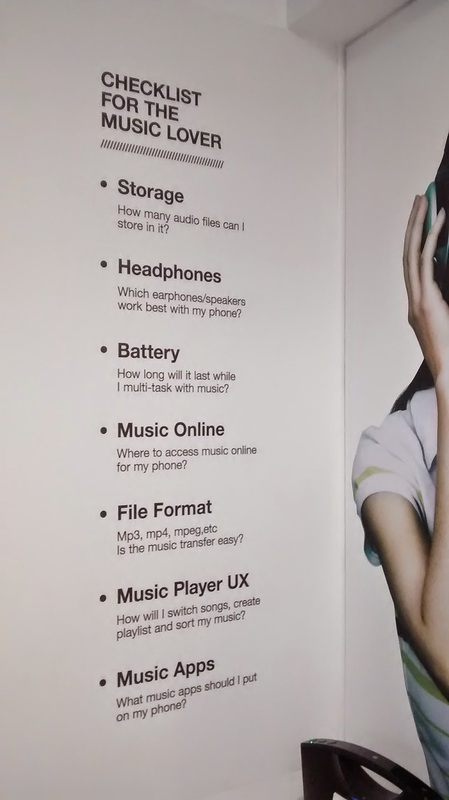 Most of the gadgets in music section were from Sony and Phillips- apparently both these companies had some trouble and were seen closing down some of their portfolios. I am told they are fully committed to phones and music. Next section of the store focuses on work-phones- for people who intend to get most of their work done over phone. Having full MS Office suite in the phone, extra power, printers and scanners etc are the focus in this section. 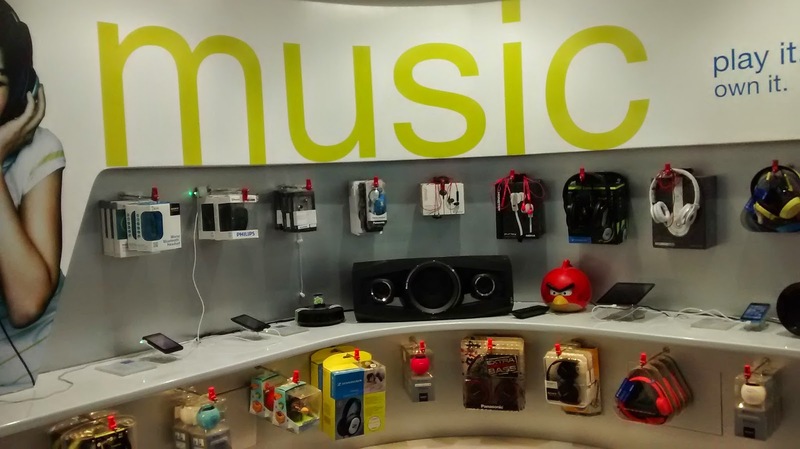 At the centre of the store is a large display area where phones that do not exactly fit into a category (Camera/Music/Work) are displayed. Adequate spacing has been ensured between the devices to ensure comfort to the guests checking them out. Apart from display, demo and purchase assistance, UniverCell Sync also offers few additional services to its customers, something online stores don't. Sync Squad: Sync These days, lots need to be done after buying the phone- such as installing right apps, loading it with your favorite music, pairing it with your car etc, in order to make the most of your smartphone experience. Sync Squad is a team of experts who will visit the homes of phone buyers, a week or two after they've bought the phone. This team can help the customer further customize the phone, clear any doubts or help with any issues customer may have in using/personalizing his/her phone. (I know Ford offers similar services to those who buy Ecosports). This is a great service where buyer doesn't have to scramble for help or search online for a problem he/she is facing. I asked how easy is the process of claiming insurance for phones- I was told that it is very simple and in about 80% of the cases, claim is honored and customers get money back. (Insurance covers 60% of purchase cost during first year, 40% during next year and so on). For phones priced upto 15k, FIR is not required to claim insurance, simple declaration/paperwork is adequate. I asked if UniverCell will take care of activities like phone de-activation, remote wipe out etc. I was told they won't do it, but will guide the customer how to get it done. I asked how's Lenovo's service- as this was a concern though their phones seemed to be rugged. I was told that Lenovo service is not a problem. I asked how should one go about chosing the right OS- The answer was something like this "If you want to lots of office work on your phone, go for Windows, as it comes with full suite of office applications and email and other functions. For generic music, photography and other usage, Android is very popular. Go for Apple if you're very particular about it"
There's a feedback kiosk, which lets visitors vote in +ve or -ve, about their experience at the store (but has no provision to capture subsequent details why someone is happy/not happy). Phone purchase is not everyday activity. When you buy one, you always want to buy the right one. UniverCell Sync is fully geared up to help you with your phone purchase exercise, bringing together the latest phones, right accessories and expert help all under one roof. In other words, you can either spend lots of time researching a phone online, or simply walk into Univercell sync store and experience the smart phones live to make a much more confident purchase decision. I am told UniverCell has about 14 Sync experience stores in India so far- covering Chennai, Bangalore, Mumbai and Pune.. More coming up soon. Got to meet few other bloggers during the event- Subramaniam, Raj, Hansini. Thanks Sulaiman... it is about 8 years now.. I too went to the Chennai UniverCell shop yesterday. I like the concept, but to make it effective, their staff members should be adequately trained. In shops, generally, customer care exes are not inclined to explain much, unless they know that you'll buy a phone on that very day. I think it's important to touch and feel phones before buying, especially the more expensive ones.